76 MMS September 2017 mmsonline.com FEATURE CAN QA GO AWAY? That customer's endorsement is arguably the most important benefit of this system. 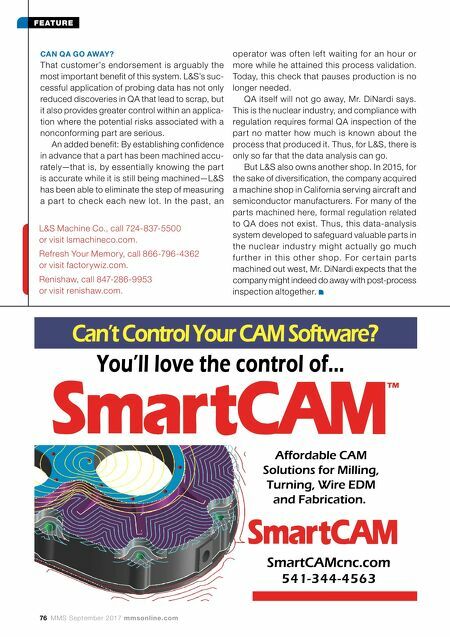 L&S's suc- cessful application of probing data has not only reduced discoveries in QA that lead to scrap, but it also provides greater control within an applica- tion where the potential risks associated with a nonconforming part are serious. An added benefit: By establishing confidence in advance that a part has been machined accu- rately—that is, by essentially knowing the part is accurate while it is still being machined—L&S has been able to eliminate the step of measuring a par t to check each new lot. In the past, an operator was of ten lef t waiting for an hour or more while he attained this process validation. Today, this check that pauses production is no longer needed. QA itself will not go away, Mr. DiNardi says. This is the nuclear industry, and compliance with regulation requires formal QA inspection of the par t no matter how much is known about the process that produced it. Thus, for L&S, there is only so far that the data analysis can go. But L&S also owns another shop. In 2015, for the sake of diversification, the company acquired a machine shop in California serving aircraft and semiconductor manufacturers. For many of the parts machined here, formal regulation related to QA does not exist. Thus, this data-analysis system developed to safeguard valuable parts in the nuclear industr y might actually go much f ur the r in this othe r s hop. For c e r ta in pa r ts machined out west, Mr. DiNardi expects that the company might indeed do away with post-process inspection altogether. L&S Machine Co., call 724-837-5500 or visit lsmachineco.com. Refresh Your Memory, call 866-796-4362 or visit factorywiz.com. 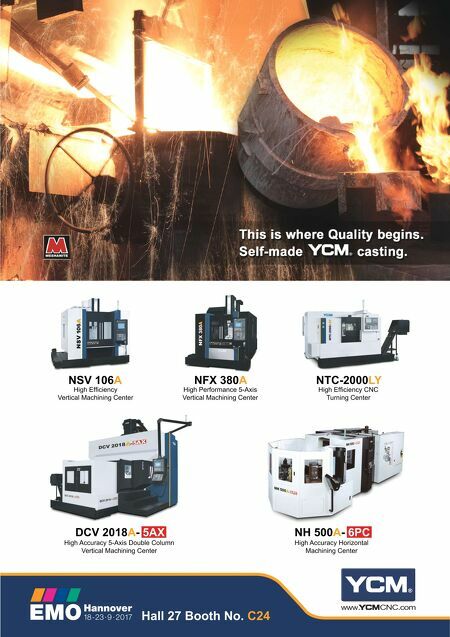 Renishaw, call 847-286-9953 or visit renishaw.com.